". . .we can no longer contain the flames drawn from the Heart of Jesus" - we are called to bring Christ to the world. We are an international religious congregation of vowed consecrated women religious. Together with our Sacred Heart Companions and Associates we are called into mission. Our spirit is one of humility, simplicity and devotion, qualities that enable us to search together for new ways to bring Christ to all, through our appropriate ministries. We strive to be joyful vearers of the Word made flesh, so tas to enable God's people to be part of Christ's liberating mission. We express our personal and communal consecrated commitment by placing ourselves at the service of God’s people, respecting the dignity and value of each person, race and nation. Our mission, in responding to God’s call, is to bring the love and compassion of Christ to all who struggle to claim their right to the adequate means for human life and dignity. By our life of prayer ‘we can no longer contain the flames drawn from the Heart of Jesus, but feel the urge to communicate them to others’. (Father Victor Braun: Frodl, 1958, p.24) - we are called to bring Christ to the world. As we live and work in God’s ever abiding presence and open ourselves to the transforming gift of his love, we share with all the kindness and compassion of the Hearts of Jesus and Mary. 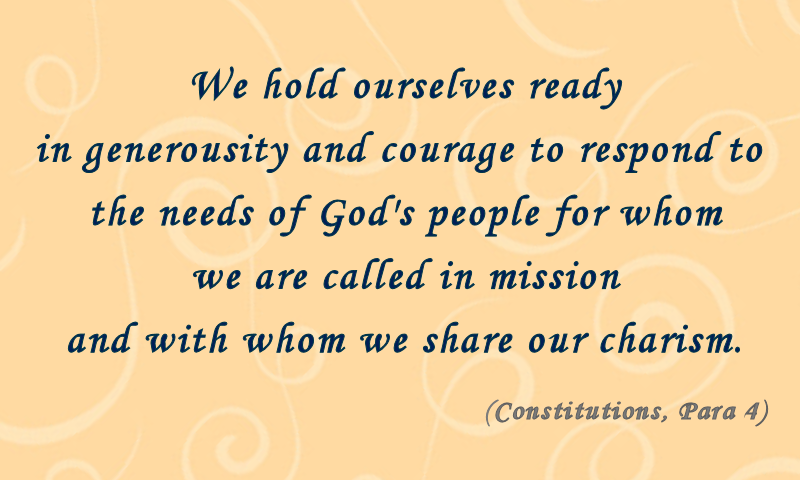 We are called to be ‘contemplatives in action’ (Letters of Fr. Braun: First Chigwell Edition, 1968). Our life in community expresses our common charism and common vision. We gather in the name of the Trinity to form communities of gentleness, justice and peace. Our shared lives witness to our commitment to live our consecration through a common vision of the gospels as we celebrate our call from God.